It’s time to look at an old sequel. 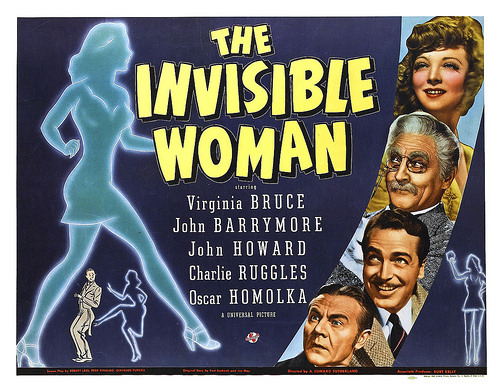 Everyone knows about the Invisible Man, but who knows about the Invisible Woman? The film seems to have fallen under the radar although I can see why. It’s not exactly a masterpiece and can be rather forgettable but at the same time I thought it was decently fun. The film goes by quickly and there’s not too much to dislike here. Granted, the characters can be annoying which I guess it fairly major, but they’re not extremely bad or anything like that. The film starts off with a crazed scientist finally coming up with a good invention. He can now make people invisible. His benefactor, Mr. Russell isn’t too pleased with Gibbs for wasting money on such an experiment but the old man is sure it will work. He writes an ad in the paper but since he isn’t willing to pay the test subject only one letter comes through. Kitty is willing to take the serum as there’s a lot she can do with being invisible. Then scientist agrees, but only barely because he tries to stay away from girls. The experiment is a success but instead of waiting for Russell to come in Kitty decides to get revenge on her boss. A lot of shenanigans occur but then a gang breaks in and they decide to kidnap Gibbs. Can the Invisible Woman save him or are they all doomed? The gang is honestly very out of place here. The whole film is really a light hearted comedy with Kitty just having fun with her powers. As such, the villains are about as serious as the kidnappers in every Air Bud movie. They aren’t exactly a threat and we even get a long scene where Kitty knocks out every member. Being invisible is honestly an incredible ability to have for every day life and you would be almost unstoppable in many situations. The villains are even driven to tears at times. Given that they are used for comedy I suppose they weren’t that bad, but I was still surprised when they showed up at all. It’s not like they really affected the outcome much at all. Kitty was a fun lead though even if she was a little too rebellious at times. She makes sure to drink as lot even when keeping a low profile and should probably be a little more harsh with the professor if she wants to stay consistent. She did a decent job of getting back at the boss even if she may have let him off a little easy there. At least he did have a change of heart so she certainly made the working environment a lot better for the rest of the models. It does seem like a pretty bad job though so they should probably just have left a long time ago. Gibbs may be a scientist but he isn’t very smart. He doesn’t realize when villains are around and holds a grudge even when you save his life. He’s exactly the kind of ingrate you would typically want to avoid to be honest and I never felt sympathetic to him. Sure, Russell doesn’t believe him, but I wouldn’t either since this guy has apparently been wasting money for many years. We can’t forget that little detail and have the guy slip it under the rug. He better product results and until then it makes sense that his funding is cut. Russell went from being rich to apparently having no money now. Of course, I won’t bring out the violin for him either. Apparently he’s one of those guys who plays the field and goes for a lot of rebounds. A bunch of characters sued him for a bunch of things and apparently they keep winning since he’s losing money. He never seems like a particularly great guy. The banter between him and Kitty is all right at best, but it’s a little generic and doesn’t make him any better. After all, Russell is insulting her looks just so he can goad her into becoming visible again. The film didn’t go for any easy pitfalls like having her appear at inconvenient times at least. That would probably happen if this film were newer so it’s another good reason to stay retro. When you think about it, not a lot happens in the film though. Act 1 is just Kitty messing with everyone, then the villains arrive and she beats them up. The film is over an hour, but it doesn’t feel like that. Of course, this is a good thing since it means the pacing was on point and the movie never dragged on but at the same time you could also make the argument that most of the film could be cut out and nothing would actually change. That’s just how it goes I guess, at least she didn’t go crazy like the last Invisible Man though. She kept her sanity through and through. One thing I’d do to improve the film would be to have a few scenes of Kitty messing with Russell. She scares the boss and spooks Russell’s assistant but she never actually gets him. Knocking him out or giving him a startle would at least give her a leg to stand on during their verbal confrontations. Meanwhile, I forgot to mention the butler. I thought he was a well written character and easily the most likable character in the film. He gives Russell some good advice and while he is always retiring you can tell that the guy really wants to be helpful. He does his best to always be there for Russell during the tough times. A fun ending would have for him to have become rich by placing some stocks in the right place or something and then leaving on a high note where Russell and Gibbs wonder where they went wrong. A sequel could then be about them turning to a life of crime with the invisibility serum. Overall, The film is a little generic and doesn’t do anything noteworthy, but it doesn’t really do anything wrong either. The writing isn’t particularly good and the characters can be one dimensional, but they are still working with a good script. Cutting out the villains may be a good idea, but they didn’t really hurt anything either. If you’re looking for a fun film where the heroine gets to use some super powers and overall look more impressive than the main guy this is a good film to check out. Especially since the guy doesn’t even seem like nice person. Just don’t go in expecting a serious film, that’d be your first mistake. This entry was posted in Live Action Movie Reviews, Live Action Movies, Reviews and tagged Adventure, Comedy, Invisible Woman, Review, Sequel, Slice of Life by dreager1. Bookmark the permalink.